YeP! Ambient music is still always breathing. It breathes of its sound corridors where the black tones are propelled such as the travels of space shuttles. Hearing illusions? Are we in the limits of the cosmos or under those beneath the ground? Heavy and black noises! Long woosh which never end of expiring and which become some powerful drones where crackle an armada of particles of prism which metamorphose into radioactive cracklings. Tetanizing waves which disrupt the sleep, while the other face of ambient music tries nevertheless to tame him. Welcome in the universe of Phobos! Where the ambient music breathes at slow gulp and where it has captivated the fans of the kind during the last Awakenings Festival held in October 2015. Except that we are very far from the cosmos here. In fact, “An October Evening” is a kind of funeral invitation where the somber and black music of David Thompson floats like a wall of breaths and of muffled lamentations from spectres. A few days away from the All Souls' Day, Phobos presented a very intimist concert where David Thompson performed his dark music in front of a public which had a chance to connect their ears to their eyes. "Awakening" begins with bells which toll. Their sound brilliances lift the muted passion of the chthonian choirs with their murmurs which evaporate in the ambient rests of some thunders. Squeakings, one would say huge doors of metal which open, wrap our ears of an aura of mysticism while that deformed synth lines are floating like mortuary clouds. Afterward, it's the momentum of long passive woosh where are dragging some sound effects which mystify the auditor, as much as the spectator presents. Between the space and the earth, the music of “An October Evening” is mooing in its heavy envelope of sinister atmospheres which is of use as decoration to images and to videos of cemeteries where stele and cross are emptying of their shadows under the protective eyes of immense mortuary statues. How do I know this? Because “An October Evening” is offered in a CD / DVD version which explains a little better the upholders and the outcomes of the music of this last Phobos. It's as much intrusive as heavy and a state of immense sadness risks to wrap those who lost a dear being recently. Without these images, one would have the clear impression that this last David Thompson's album is an ode to a solitary astronaut who derives towards the cradle of its genesis. 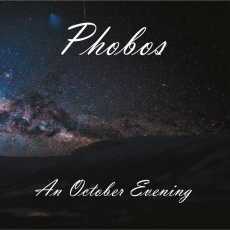 It's Phobos with a heavy and very intrusive dark ambient music. "Evening Sky" is a beautiful small surprise which goes out of Phobos' repertoire with a delicate and a very magnetizing rhythm which skips weakly like a very good funeral style of down-tempo. Percussions in contrasting tones sculpt a basis of light rhythm which is transported by skin-tight waves, always very mortuary, and layers of absent voices. That reminds me enormously of The Glimmer Room or still Solar Fields. It's very good! Making contrast with the heavy atmospheres of funeral evenings in "Awakening", "Drift Away" brings us back to the almost celestial ambient universe of Phobos. A few words about the DVD now! Without menu, you slip it into your laptop or in your DVD player (it's region free) and you have the music and the images. It's remains a sober shot of the white screen where the images fade out and melt together for nearly one hour during this performance of Phobos at the Awakenings on the night of October 17th 2015. That helps to understand a little more the spirit of David Thompson. That helps to encircle better his vision and his inspirations. And that remains a very good idea to couple the picture in a music for which we try constantly to interpret its senses. From where its beauty. From where its magic!